Happy Saturday everyone!!! I hope this schedule Post works.. eeekk. 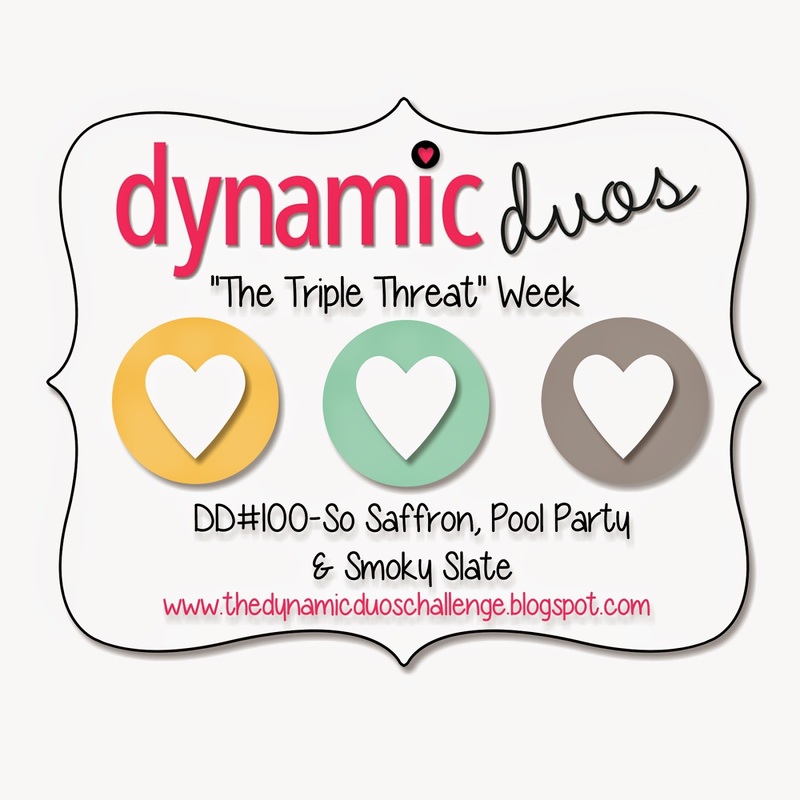 This week it's a fun new color combo at Dynamic Duos.. It's a "Triple Threat" week and it's also the last Challenge. Yes you read that right this will be the last Dynamic Duos challenge. We're going out with a Bang! How pretty are these colors together? Love it!!! I cased a project from the Occasions catalog.. well the tag part and made it into a card and changed it up some. 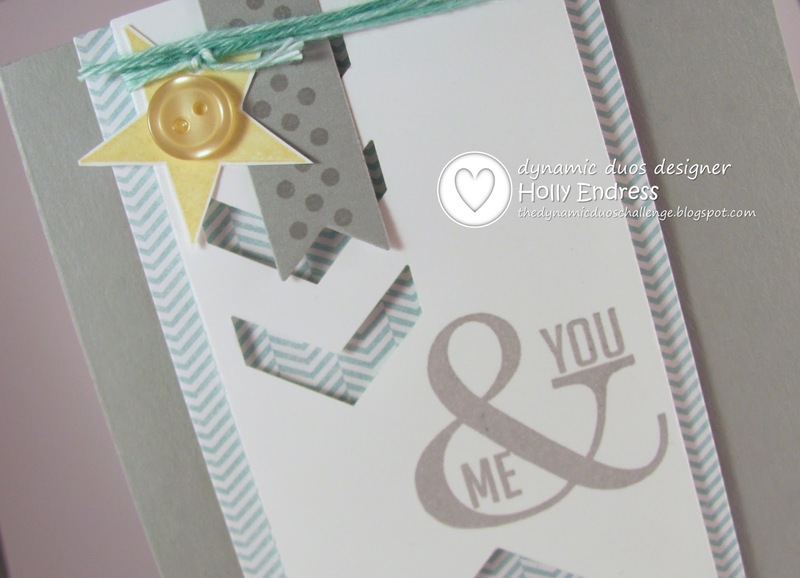 My card base is Smoky Slate and using the Banner framelits I created a tag with a piece of DSP & Whisper White card stock. I used the chevron punch along the side. I used the Perfect Pennants set for the Star and then sentiment and the dots on the top banner. This is such a fun set to use with those edgelits. I added a So Saffron Button and I created my own Pool Party twine using the ink pad and some white baker's twine. Thanks for stopping by today.. Head over to the Dynamic Duos blog and see what the other Design Team members created. We hope you will join us. The challenge is open until Thursday @ 12pm PST. Holly- this card is wonderful!! Love the use of the Banner Framelits along with all of the other elements! It is has been so much fun being on the Design Team with you again and look forward to seeing your creations in the future!! Hugs and God Bless, my friend!! Wonderful card, Holly, and wonderful to have worked with you on DD! Sad to see it end. It was great to meet you. Blessing to you and your family, and of course happy stamping! 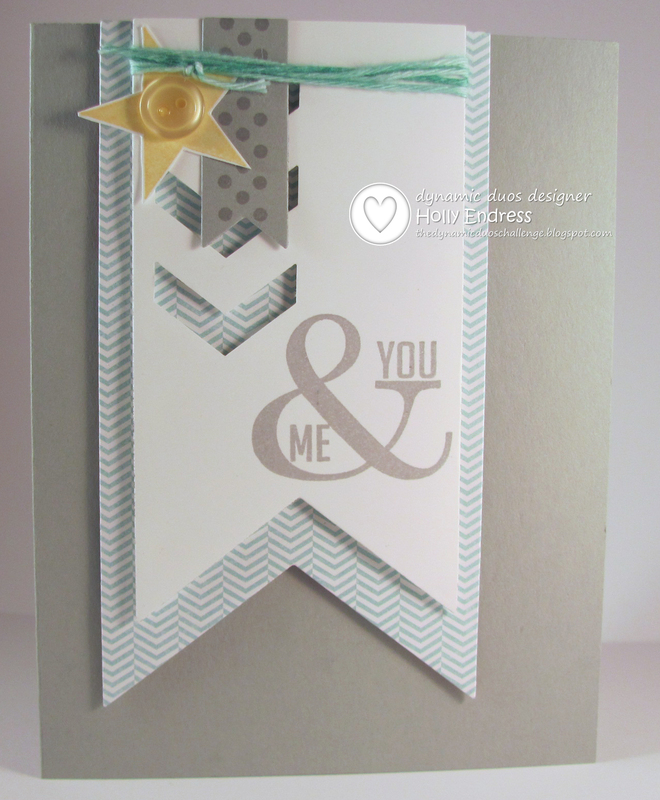 Your card is stunning, Holly and I think you showcased the colours perfectly! Thank you for your hard work and commitment these past 6 months. It has been a pleasure working with you again. I love the use of negative space with the chevron punch. This card look fabulous! Love your card Holly. The star and punched chevrons are perfect accents. Great job with the challenge colors. It has been fun working with you on the DD design team. Awesome, graphic and just plain fun card, Holly. The peek-a-boo chevrons are great. I'll miss creating "with" you every week, but I'm going to try and play along with the Friday Mashup more regularly. See ya in blog-land! I love this card, Holly! All the details are perfect. I'll miss being on the design team with you, and I hope to see you around the internets! Super soft but graphically bold at the same time. Love it, Holly. It has been fun working with you on DD- but you are not rid of me yet!